A coyote in snow on the Hanford Reach National Monument near the Columbia River shoreline. Right now, in the Northwest’s high desert, the biscuit root should be ready to bloom. Pregnant ground squirrels should be up to the surface, munching fresh shoots. But that’s not happening. On much of Washington’s and Oregon’s eastside, snow has been on the ground for six weeks, and it has some experts wondering how life will shake out for stressed flora and fauna. Heidi Newsome, is a wildlife biologist for the U.S. 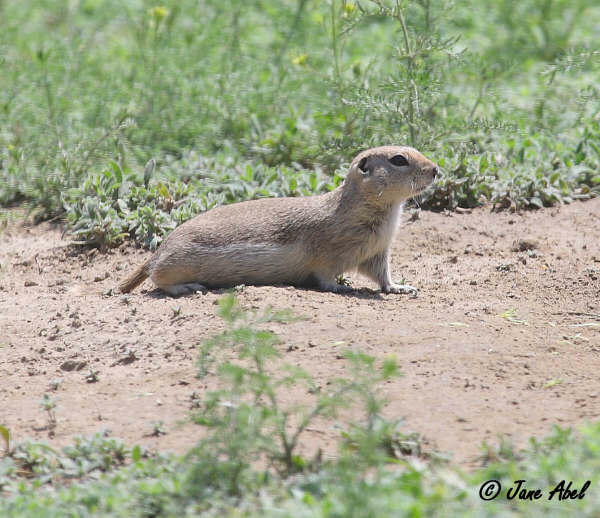 Fish & Wildlife Service out of Burbank, Wash.
“Certain animals that hibernate during the winter -- they’re sort of coming out and trying to regain their nutrition after hibernating for a long time,” Newsome says. Lately, Newsome has been worrying about tiny, threatened ground squirrels. Larger animals like elk and deer are spending a lot of energy digging through the crusty snow to reach any green. And Newsome says people have been bringing her dead juvenile hawks. When she inspects them the cause of death is clear: starvation. And migrating birds like sandhill cranes are getting stressed. Flying north from Mexico, they usually stop over in this part of Washington for a refuel on their way to Alaska. But the birds are finding few bugs, green shoots or leftover grain in the snow-covered fields. Free-flowing water is hard to find, too. Mike Denny is an avid birder. He’s slinging binoculars and a massive camera around his neck. Pointing above his head, Denny hones in on three cranes swooping in for a landing, a mating pair and their young hatched last year. “Look at that, just beautiful!” he exclaims. Mike Denny, an avid birder from College Place, Wash., scouts out a group of migrating lesser sandhill cranes near Richland. He’s worried the lingering snow is making life difficult for the travelers who need to refuel for their continued journey to Alaska. This is one of his favorite crane-spotting places. It’s a corn field on a backroad just outside of Richland, Wash. The cranes call out to each other in an eerie whirling repeat. 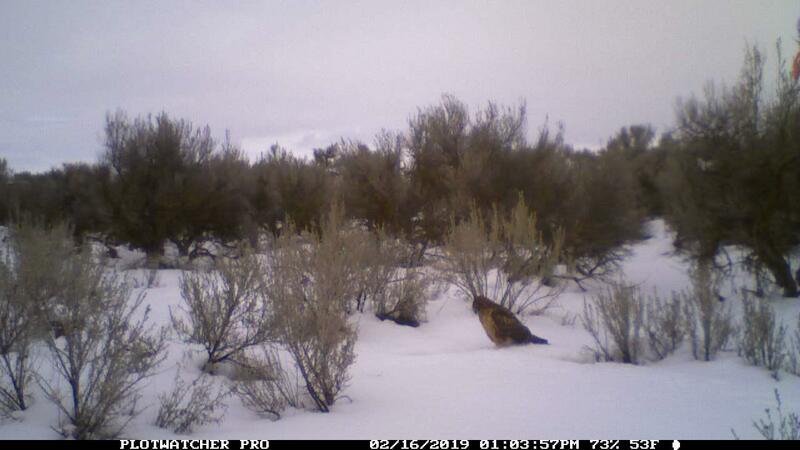 A Mid-Columbia red tail hawk looks for a ground squirrel lunch. When it snows, ground squirrels are more visible and so vulnerable to predators. All this snow so late in the season prompts the much-asked question: Is this climate change? Kathie Dello, a climatologist with Oregon State University in Corvallis, says this late-winter snow is perfectly normal. But, it doesn’t mean the larger picture is all fine. For plants, all the snow now means a bumperload of moisture timed just before the warm weather for the scourge of the West: invasive cheatgrass. It’s a fast-growing spring grass that crowds out native plants and dries early into a dense, brittle carpet. Biologist Heidi Newsome says it’s bad news. The one silver lining about all this snow? Newsome says it could also encourage a dramatic wildflower show when the weather changes to more normal spring conditions. In the Northwest’s Cascades, there’s snow at high elevations, but it’s scored by vertical lines showing where rain has run downhill. This warm El Niño winter in the region is worrying water managers and farmers. Many Washington and Oregon reservoirs aren’t filling up like they should, and snowpack levels are below average in many areas. Grizzly bears have been listed as threatened under the federal Endangered Species Act since 1975. In Washington, they are considered endangered. Last week, federal officials unveiled their draft plan to reintroduce grizzlies in North Central Washington.